CHARLES WOODSON UNIVERSITY OF MICHIGAN STADIUM photo picture print for sale. 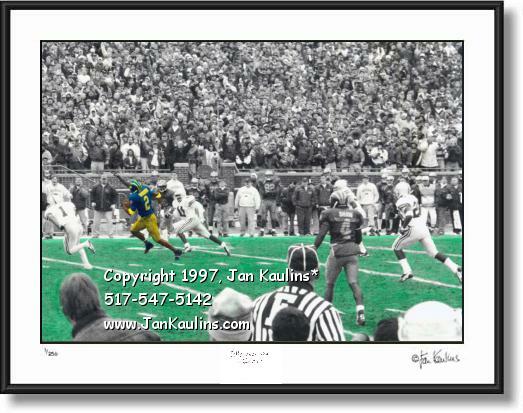 Charles Woodson UofM Ann Arbor U of M photo art print for sale. U of M CHARLES WOODSON 1997 picture print photo. Michigan Stadium Ann Arbor University of Michigan Stadium photo picture photograph print for sale: This color classic Charles Woodson picture photo of The U of M University of Michigan Stadium in Ann Arbor, Michigan is made from an original black and white hand-colored photo. This University of Michigan Stadium Charles Woodson picture photo was taken during a game at University of Michigan Stadium during the 1997 defeat of arch-rival Ohio State (U of M: 20, Ohio State: 14). This important win sent coach Lloyd Carr and the Michigan Wolverines, along with Michigan Cornerback #2 Charles Woodson to The Jan. 1, 1998 Rose Bowl in which they proceeded to win The National Championship. In this historic University of Michigan Stadium picture photo we see a picture of the crowd on its feet as it cheers for Heisman Trophy winner #2 Charles Woodson, during the game where Woodson ran for a University of Michigan touchdown with a spectacular 78 yard punt return. In 1997 The University of Michigan Wolverines went (8-0) in The Big Ten Conference and (12-0) overall. This photo has a wonderful vintage feel with all of its black and white portions and the film grain adding to its charm. This historic University of Michigan U of M Michigan Stadium Charles Woodson photo would be a great gift for a member of The University of Michigan Alumni Association or any U of M student! PLEASE TAKE A LOOK AT THE OTHER UofM PHOTOS AVAILABLE ON THIS WEBSITE BY CLICKING ON THE 'GO BACK TO...' LINK ABOVE THIS PHOTO NEAR THE TOP OF THIS PAGE.